MainBlogsAmerican Left Defends Anti-Israel BDS as "Free Speech"
American Left Defends Anti-Israel BDS as "Free Speech"
Among the senators claiming that BDS should be protected as "Free Speech" are Jews, and no surprise that the extreme Leftist J Street also opposes the bill. American Jewry on the whole are extreme in their unquestioning support of the Democrats and the Left. I don't think there's an actual Mitzvah, Torah Commandment they observe more than voting for Democrats. Even today, when the 21st century Democratic Party has adopted policies that support the destruction/annihilation of the State of Israel, Jewish Americans have continued their unquestioning support. It's no secret that most American Jews eat the Torah-forbidden ham and shrimp, besides not having a clue that there's a fast day mid summer called the 9th of Av when we mourn the destruction of our Holy Temple in Jerusalem. Intermarriage has passed the tipping point, and it is now the norm, except in the most Torah observant circles. It is also rationalized/justified with Leftist slogans of "equality" and "free speech." American Jewry has become so pro-Left Democrat that many actually oppose the American Embassy in Jerusalem, davka, because it was opened by a Republican President. That's the proof that they have ceased to think as Jews; they are now religiously Leftist Democrats. I'm saddened by this development. And I'm pessimistic. The future of the Jewish People is here in Israel, no place else. Europe and other parts of the world are no better for Jews to remain true Jews. 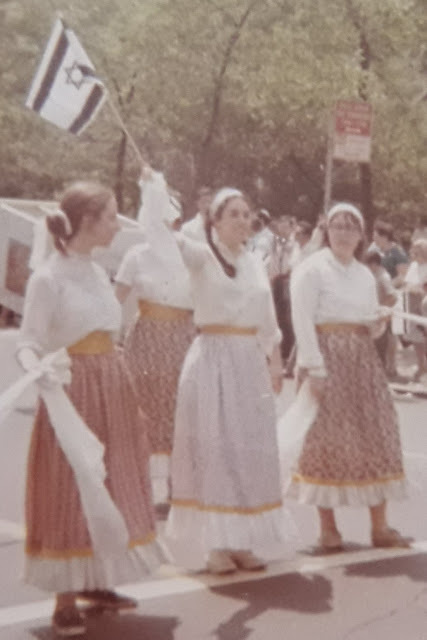 Here I am marching in the 1970 Salute to Israel Parade with NCSY, just a couple of months before making aliyah, moving to Israel. It was the best move we could ever have made, B"H, thank Gd.